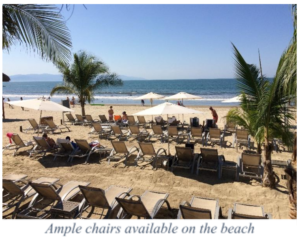 Traveling from one of the northerly parts of North America as winter approaches requires some acclimatization when you step off the plane in sunny Puerto Vallarta. It was a Saturday and probably one of the busiest times for the Licenciado Gustavo Díaz Ordaz airport, known to most North American travelers as Puerto Vallarta International Airport (PVR). As you make your way through the multitude of timeshare sellers pouncing on the unsuspecting traveler, you will come to a plethora of sign-wielding resort representatives toting either their resort name or your name. We found the Hard Rock guitar-shaped sign and confirmed our identities with the helpful man who guided us to our transportation. 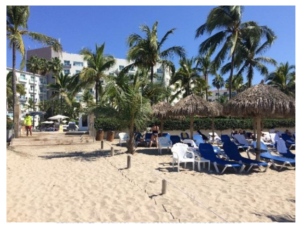 After approximately 20 minutes we reached the Hard Rock Vallarta’s main entry and were directed to the check-in. Check-in, considering it was a Saturday, was reasonable time-wise and we received our ‘package’ and went to our room, which was considered ‘partial ocean view’. However, there was a good view of the ocean from all the North wing suites, but most suites actually do have a full ocean view. After unpacking and getting out of our travel clothes, we dressed more appropriately and went on our tour of the resort. Naturally, as with all time-share resorts, there was the usual approach for your ‘orientation’, which we declined initially. However, for the purposes of this blog, we did meet with a representative to find out what they had to offer. As experienced timeshare owners, we were very savvy to the ‘deals’ and ‘offers’ associated with these types of presentations. One of the highlights of their offering was the ability to purchase blocks of time with no maintenance fees. 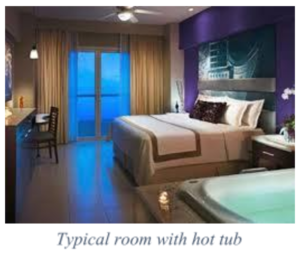 This would be advantageous for those wishing to include the Hard Rock properties into their vacation plans at considerably reduced costs. 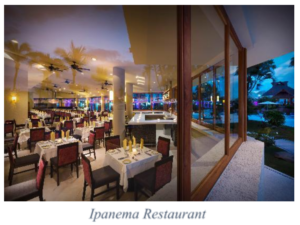 The resort has several eating and drinking areas that provide a good variety of options depending on your tastes. There is Asian (Zen), Italian (Ciao), Mexican (Frida) and Brazilian (Ipanema). There is also a buffet restaurant (The Market). Outside, around the pool, is a pizza stand that makes wood-burning oven-fired pizzas, so there is something for everyone. Our first sojourn into eating was at the Ipanema Brazilian restaurant. If you are not familiar with this style of eating, it is somewhat unique. Firstly, you visit the buffet section where there is everything from salads to vegetables prepared in a variety of ways, as well as bread, sushi, cold meats and cheese. Making sure you leave room on your plate, you return to your table and turn the ‘coaster’ to show the red side (the other side is green). This symbolises that you are ‘receiving’ food. Various servers approach your table from time to time with a meat-filled spit, from which they slice a portion and you use the supplied tongs to put it on your plate. There was beef, short ribs, chicken, sausage and turkey. I must say that they were all absolutely delicious (unfortunately, we were full and did not get an opportunity to taste the turkey). This is where you turn your coaster to the green side to signify that you do not want any more. As an aside, when we comment on food, it is based on our very extensive experience in gourmet dining, being a 30+ year member of the international and renowned association, la Chaine des Rôtisseurs. The Hard Rock series of locations is part of the Palace Resorts group owned by the Chapur family and headed by brothers José and Roberto. Rumours had circulated at one time that there was a rift in the family accounting for the apparent division, which is vehemently denied by the family. The problems within the Palace chain can more directly be attributed to a perfect storm of contradictions (both literally and figuratively with Hurricane Wilma in late 2005). The convergence of the devastating storm, a global economic downturn, a “swine-flu” pandemic, and a rapid and widely publicized increase in violence related to the Mexican drug-economy, Palace Resorts (as well as all Mexican resorts) began to suffer from decreasing profit margins, and began seeking to partner with other hoteliers since at least 2008. In 2009 a press announcement was made about a deal struck between Palace Resorts and Wyndham where the Beach, Cancun, Isla Mujeres, Playacar, and Xpu-Ha would all be rebranded as Wyndam Resorts. For reasons I still have not been able to identify, the Wyndham partnership was severed within 8 months of having been signed, and a search for a new partner was initiated. Through 2011 and 2012 a relationship was established with Hard Rock International, first at the Punta Cana property, and then expanded to include several resorts in Mexico. 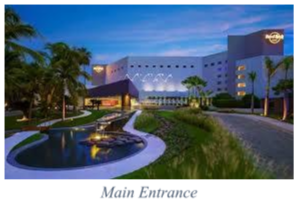 José Chapur remains at the head of Palace Resorts, while Roberto Chapur would take the helm of the newly re-branded Hard Rock resorts. The Vallarta location was, up until about four years ago, the Vallarta Palace and started life circa 1990 as the Radisson Sierra. The theme pays tribute to the rock era and the décor reflects that theme. The walls are adorned with various rock memorabilia as well as quotes from artists, both past and present. The guitar is a ubiquitous symbol throughout the resort, and you can even request a guitar to jam in your room. Naturally, music abounds both inside and outside and is ever present poolside, so much so that if you are looking for a quiet area, it is difficult to find, except for the beach. The beach is excellent with a very shallow slope ideal for the kids and those less comfortable in the water. With a large expanse of sand and numerous palapas to shield one from the hot sun…and no speakers…it is the ideal spot for just relaxing. Resort staff are on hand to ensure that you don’t die of thirst while out there. For our second day, we elected to try the Asian restaurant. 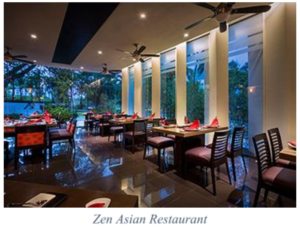 The décor was naturally Asian-influenced and tastefully done. The staff were very friendly and we were served a selection of delicious appetizers while we perused the extensive list of Asian dishes. Along with the usual sushi and rice-based fare, they offered combo plates that included an array of four tasty portions of their main dishes…an excellent way to try a wider range of food. For the most part, the food was very good to excellent and due to the wide mix of flavours, would appeal to a variety of taste buds. 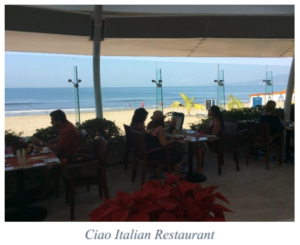 Ciao, the Italian restaurant, was next on our list of culinary adventures. Unfortunately, it wasn’t the taste experience we had been used to so far. When my meal was served, I had to send it back because the Chicken Parmigiana was only lukewarm. When it was returned, it was certainly hot enough, but the side of Spaghetti Pomodoro was only average. My companion’s dish, a penne pasta, was seasoned with too much pesto for our taste. I ordered a Tiramisu for dessert, but had to admit that it was not the best I have tasted. Also, I would expect that one would be able to get a good cappuccino in an Italian restaurant, but it was only average. I prefer my cappuccino served in a wide-rimmed china- rather than a footed glass- cup. I realized later that the cappuccino was not made with decaffeinated coffee and I spent most of the night in a half sleep. There was only one more a la carte restaurant to try, which was the Mexican, Frida. The décor was very apt and themed for a Mexican garden. 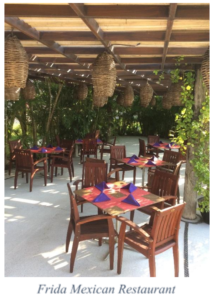 Most of the tables were outside, underneath a wood pagola with palm plants forming the sides, while others were located beneath a large palapa. The friendly staff made sure that our meal was a delight, and they didn’t disappoint. Initially, we were served a selection of coloured tortilla chips and thin-sliced dried plantain with dipping sauces. My companion selected a dish of short ribs while I opted for the sea bass. Both were served in a delicious-looking arrangement and were delectable. Of course, we had to view the dessert menu and my favourite, arroz con leche (rice pudding) was there, so I knew what I was going to order. It was very nicely arranged and tasted divine, as was my companion’s churros (sweet strips of fried dough, similar to a donut). We capped the evening’s culinary adventure with a Bailey’s. Overall, we had a good experience at the Hard Rock. Staff were friendly and courteous and service was very good. The room we were in was comfortable, except that it was at the end of a long corridor and it took a while to get hot water. It was equipped with the ubiquitous hot tub which seems to be a signature of Palace Resorts (I’m wondering how many actually get used). Internet connection, although sometimes sporadic, was free and, for the most part, worked well. There are numerous activities available both inside and outside the resort. The town of Puerto Vallarta is steeped in history and is a must see if you have never been there. Another must see is the Rhythm of the Night performance. This entails a boat ride to the tip of Banderas Bay where you will be treated to an excellent meal and a great show…all outdoors. You can also check out Vallarta Adventures for everything from zip-lining to SCUBA diving. The resort offers a plethora of activities throughout the day from 10:00 a.m. until 9:00 p.m. and includes just about anything from Yoga and stretching exercises to volleyball and beach soccer. Evenings provide various shows that are predominantly music oriented. The resort offers a very good spa and fully-equipped gymnasium. Many extra items can be ‘paid’ for using the resort credits offered. For me, however, I found it somewhat misleading. They offer US$1,800 of resort credit, but you have to pay 20% of the price, so essentially, the resort extras are ‘discounted’ 80%. Sounds good until you realize that prices appear to have been hiked accordingly. I was shocked to pick a wine thinking the prices were in Pesos, only to discover that they were in US$! The price I eventually paid was no less than I would have paid at any restaurant. Similarly with the spa; prices, in my opinion, seem to be inflated (US$520 for an 80-minute facial), but at 20%, they are reasonable and what you might pay at home (US$104 for the above-mention facial). As long as you are aware of this, then there are some good deals available, but I would have preferred a less veiled promotion for resort credits.